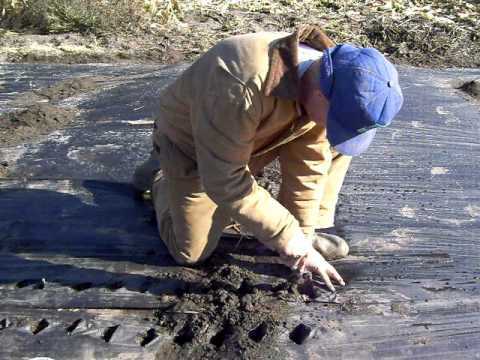 After the first cut which is the depth of the trowel, so 6″ deep and 5″ apart, Ken returns to each hole and makes a second slice in the plastic the opposite direction, horizontal to the t-tape creating an X in the plastic mulch. He drives the trowel down 6″ again and wiggles it back and forth to make the hole. At this point he can pick up one of the “popped” cloves of garlic out of the bucket and holding it firmly between his fingers push it straight down into the hole so that it is about 2″ deep and covering it with another 1″ of soil. You will want to be sure and press the bottom of the clove where the roots are going to grow tight against the dirt. We did a quick video just to show how fast it really is to seed the garlic. It only took 4 days between Ken seeding and me popping the garlic to get it all planted; of course that is with all the interruptions of daily living, rain, etc. We were pretty proud of ourselves for getting it done before it was any later in the season. We have had some pretty cold nights and it is best to have the garlic growing for about 3 to 4 weeks before the ground freezes solid. Below is a picture of what it should look like by next April. Notice how the garlic has found it’s way up to sunlight through the plastic mulch. The X that the trowel makes by slicing both ways is just enough for the garlic to get through. Sometimes we have to help it but it mostly comes through on its own. Now we will wait patiently for Spring to see how it does. If you want to learn more about growing garlic a good book that I have read is Growing Great Garlic by Ron Engeland or there is more information in some of the other books listed below. You’ve got to be kdding me-it’s so transparently clear now!